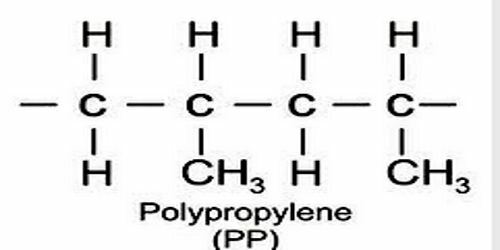 Polypropylene is any of various thermoplastic resins that are polymers consisting of repeated branched units derived from propane and having the formula CH2CH(CH3), usually with the methane groups (CH3) all on one side of the chain. Polypropylenes are similar to polyethylenes but are harder and tougher and are used to make molded articles and fibers. An addition polymer made from the monomer propylene, it is rugged and unusually resistant to many chemical solvents, bases and acids. Phillips Petroleum chemists J. Paul Hogan and Robert Banks first polymerized propylene in 1951. 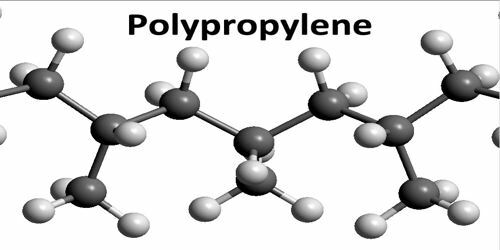 Propylene was first polymerized to a crystalline isotactic polymer by Giulio Natta as well as by the German chemist Karl Rehn in March 1954. This pioneering discovery led to large-scale commercial production of isotactic polypropylene by the Italian firm Montecatini from 1957 onwards. Syndiotactic polypropylene was also first synthesized by Natta and his coworkers. Polypropylene has a relatively slippery “low energy surface” that means that many common glues will not form adequate joints. Joining of polypropylene is often done using welding processes. The first commercial production of polypropylene was in the 1950s following the discovery of Ziegler-Natta catalysts. It was produced initially in a slurry process where propylene is reacted in the presence of a catalyst in solvent to produce a mixture of crystalline and amorphous polymer. The disadvantage of this route was that the catalyst had to be treated with alcohol to deactivate and extract it, while unwanted atactic polymer had to be extracted and removed. Melting process of polypropylene can be achieved via extrusion and molding. Common extrusion methods include production of melt-blown and spun-bond fibers to form long rolls for future conversion into a wide range of useful products, such as face masks, filters, diapers and wipes. Polypropylene properties vary according to molecular weight, method of production, and the copolymers involved. Generally polypropylene has demonstrated certain advantages in improved strength, stiffness and higher temperature capability over polyethylene. Polypropylene has been very successfully applied to the forming of fibers due to its good specific strength which is why it is the single largest use of polypropylene. Polypropylene also happens to be one of the lightest plastics available with a density of 0.905 g/cm². The melting point of polypropylene occurs at a range, so a melting point is determined by finding the highest temperature of a differential scanning calorimetry chart. Perfectly isotactic PP has a melting point of 171 °C (340 °F). Commercial isotactic PP has a melting point that ranges from 160 to 166 °C (320 to 331 °F), depending on atactic material and crystallinity. Syndiotactic PP with a crystallinity of 30% has a melting point of 130 °C (266 °F). Below 0 °C, PP becomes brittle. 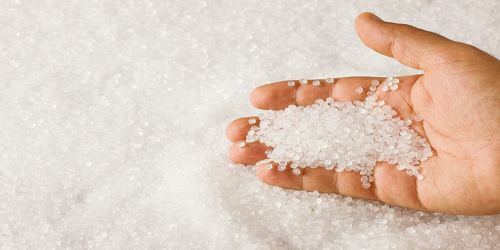 The large numbers of end-use applications for polypropylene are often possible because of the ability to tailor grades with specific molecular properties and additives during its manufacture. For example, antistatic additives can be added to help polypropylene surfaces resist dust and dirt. Many physical finishing techniques can also be used on polypropylene, such as machining. 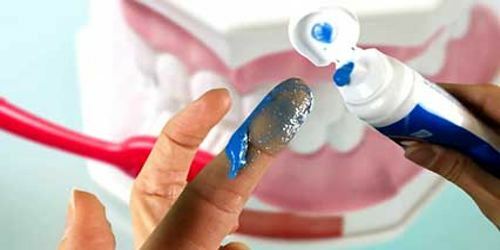 Surface treatments can be applied to polypropylene parts in order to promote adhesion of printing ink and paints.